It feels a little weird to sit and reminisce about decades-old audio equipment while listening to Pandora, but there seems to be an influx of stories and blog posts honoring the 30th anniversary of the Walkman and various other music consumption gear. So when I started seeing several places mentioning a website devoted to boomboxes (look under the "Golden Years" section), naturally my curiosity got rolling. Namely...would they have a photo and/or a mention of my very first portable stereo? "Another Sanyo, this one from 1983 boasts a 4 band tuner, 10 step VU/Sound Level LED display and AMSS, aka automatic music search. What's AMSS? It's a "smart" feature that allows you to rewind or fast forward through songs, then stopping just before the next one begins (similar to skipping through a CD's tracks). It's nothing more than a noise detection mechanism, that stops the motors when the player hits a spot on the tape with no audio." I can't remember if it was a birthday or Christmas gift, but that thing got hauled all over West Texas to innumerable athletic events, and as with previous generations of student-athletes that attended my small, private alma mater high school, there was the unspoken agreement that if music with "objectionable content" was being played in the van (yeah, we traveled in vans...we were that small), several occupants would cough loudly when the objectionable word(s) would come up. Our coaches/teachers must've thought there was an odd case of pleurisy that only appeared during weekend athletic trips. 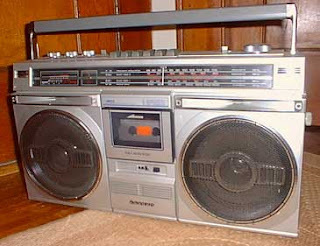 It was also part of my audio arsenal throughout college, and even made the move to Tennessee, finally settling in my bathroom and serving as my morning entertainment as I got ready to head to the Banner at 5:15am. I'm sure my neighbors appreciated that. I also can't remember what eventually happened to it, but I think the thing finally shorted out due to residing in a bathroom for a few years. I wonder...is there going to be this same kind of nostalgia when the iPod generation starts getting early onset mail from AARP? I'm betting not. After several weeks of not buying anything on eBay, you've sent me back on the path towards my eventual financial ruin. Thanks a lot. Send it off to Ben Heck, he can probably mod a MP3 player into it somehow. Saw your video on YouTube (13 Words). "Coldpraise" is hilarious. You're still the man.